I love the fact that even after spending many hundreds of hours researching the Atcherley family, its members can still surprise me. One such surprise, a bombshell in fact, came when I looked at the expanded collection of London Workhouse records at Ancestry this week. In one of the Porters Admission and Discharge Registers for Christ Church Workhouse, Southwark, was Henry Atcherley [ ], who had died in the workhouse on 15 March 1900. Listed in the column headed “Address of Relations or Friends” was a niece, Mrs Tilley, who I recognised. Beneath this entry was the bombshell, someone I certainly did not recognise: a son of Henry Atcherley, named William Lockyer! This discovery has sparked a few days of intensive research into Henry Atcherley and his complicated family life. Although some gaps in my knowledge remain, I now know much more about Henry and those who were, if only temporarily, close to him. In this article I will look at the early part of Henry’s life, and the first of his two families. Henry Atcherley was born on 23 April 1824 at Walworth in the parish of Newington, Surrey. However he was not baptised until 1 January 1832. The baptism register of Newington St Mary shows that Henry originally had two forenames – William Henry – the first of which he dropped. The register also shows that Henry’s older brother George Atcherley [ ] (born on 9 August 1819) was baptised with him. The entries for the two boys recorded their parents’ names as James and Sarah Atcherley, their family’s abode as Missionary Place, Walworth, and the “Quality, Trade, or Profession” of their father as “Gent”. James was certainly a Gentleman, but he was also a retired Captain of the Royal Marines (see An Atcherley at Trafalgar). And although Sarah [ ], the mother of George and Henry, was given the surname Atcherley she was not in fact married to James. Her real surname, which she chose not to use, was Perkins. Within three years of the baptisms of George and Henry, Captain James Atcherley was dead. This left Sarah to complete the upbringing of his youngest sons. The trio did not remain at Missionary Place. By 1841 Sarah, George and Henry were living nearby at Clandon Street in Walworth. The family name was not written accurately or clearly on the enumerator’s schedule – my reading of it is “Alcherty”. One result of this is that now, over a century and half later, transcriptions of the surname on the major genealogy websites include Alberty and Alchesty. I found these ‘missing’ Atcherleys by searching for Henry (no surname), born 1824 (+/- 2 years) in the St Mary Newington Registration District. The 1841 census is the last record in which I have found Henry’s older brother George. He was then aged 21 and he was working as a labourer, his fate is unknown. It is also the last census on which another brother, John Atcherley [ ] (born 26 October 1817), appeared. He was enumerated at Greenwich, Kent, on the Dreadnought Hospital Ship for Seamen. Though he was 23 years old his age was (like George’s) rounded down to 20 on the census schedule. He was an Able Seaman, but the letter ‘P’ written beside that designation showed that he was a patient. The Dreadnought, a former Royal Navy man-of-war run by the Seamen’s Hospital Society. The census showed that on the night of 6/7 June 1841, in addition to John and his fellow patients, the ship was occupied by two surgeons, three medical surgical pupils, a nurse/barber, five nurses, naval crew with families, and a female servant. When John Atcherley died aboard the hospital ship on 16 October 1841, he passed away on a vessel which had fought with his father’s at Trafalgar. 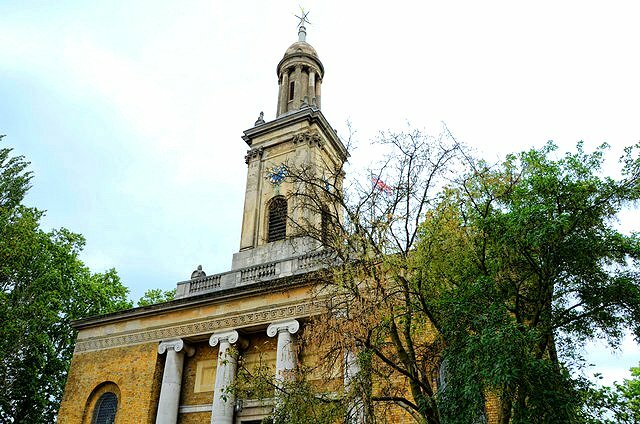 John was buried at Walworth St Peter on 23 October 1841, the place where James Atcherley of the Royal Marines had been laid to rest some seven years earlier. As for Henry Atcherley, he was 17 at the time of the 1841 census (his age was rounded down to 15 by the enumerator), and he was employed as an engineer. He would spend most of his remaining years fitting, driving or otherwise working with steam engines. On 13 August 1850 Henry was ‘ticketed’ as a merchant seaman (Register Ticket 478,836, Capacity Engineer). Although his entry in the register of merchant seamen stated that Henry first went to sea (as an engineer) in 1850, it showed no reported voyages from 1845 to 1854. The register did however record a few facts about Henry’s appearance. He was 5 foot 7¼ inches in height and he had a fresh complexion, brown hair, blue eyes, and no distinguishing marks. The census of 1851 found Henry, an engine fitter, at 16 Brandon Street in Walworth with his mother. Sarah declared her surname to be Atcherley, and her marital status as Widow. Henry on the other hand stated that he was unmarried. Although this was true, the same census included, elsewhere in the same parish, a woman who had, like Henry’s mother, taken the Atcherley surname without having actually married. The ‘husband’ of the woman in question was Henry, although he seems to have been an ‘absent father’ at that time. Arabella Atcheby (as her name was written), a dress maker aged 25, was living at London Street, Newington, with her daughters Arabella [ ], 5, and Ellen [ ], 3. All were born at Newington. Although Arabella stated that she was married, I have found no record of such an event. The birth certificate for her first daughter (see extract below) shows that she was Arabella Dackombe [ ], and her age and birthplace indicate that her parents were Daniel Dackombe and Mary Ann (née Rook). She was born 11 May 1826 at Newington and baptised 14 June 1829 at Walworth St Peter. The baptism register of Walworth St Peter shows that Arabella’s daughter Arabella Maria Atcherley was born 19 May 1845 and baptised on 7 September 1845, when the family’s abode was at Lambeth. The register for St Mary Newington meanwhile shows that Ellen Sarah Atcherley was born 5 October 1847 and baptised on 19 May 1850, when the family was living in Guildford Street. In both cases the girls’ parents were named as Henry and Arabella Atcherley, and their father’s trade recorded as Engineer. Between the arrivals of these two girls another daughter had been born – and had also died. As with her sisters, the birth of Mary Ann Atcherley [ ] was registered (so too was her death), however she was not baptised. She was interred, aged just 6 weeks, on 20 November 1846 at Walworth St Peter (pictured below), the burial register showing that her family’s home was in Eltham Street. Another daughter by the name of Mary Anne was to follow. It appears that Henry’s spouse Arabella (perhaps, at that point, his ex-spouse) was pregnant when the 1851 census was taken, and that Mary Anne Atcherley [ ] was born later the same year. I have, unfortunately, found no record of her birth being registered, nor of a baptism taking place. Ten years on, Arabella was still a dressmaker living at Newington (at 5 Frederick Street), now with three girls, and she gave her status as ‘wife’. But by this time her family’s surname had been corrupted further, to Atchley. It was to remain that way, with all three daughters using it when they married. Banns of marriage between Arabella Maria Atchley and John George Hilder were read at Christ Church in Southwark in April 1870 (the register giving Arabella’s surname as Hatchley). Although these banns were not followed by a wedding at that time, the couple appeared on the 1871 census as John G and Arabella M Hilder, a married couple. Banns were read again, at the same church, in December 1873 (this time John was said to be a Widower rather than a Bachelor), but once again there were no nuptials. John and Arabella finally tied the knot, at Emmanuel in Camberwell, on 26 December 1875. John’s death was registered at St Saviour Southwark about three years later in the first quarter 1878, but I have not found any further records for Arabella. Ellen Sarah Atchley married with her first cousin Aquila Dackombe at Newington Trinity on 29 March 1869 (Aquila later acted as a witness when John Hilder finally ‘made an honest woman’ of Arabella Maria Atchley in 1875). Aquila and Ellen lived at Flint Street, Walworth, where they had seven children before Ellen died in 1881. More information about this family can be found on the Dackombe Family History and Genealogy website. Mary Anne Atchley wed Thomas Gussin, a brewer, at Newington on 3 August 1873 and resided with him in Lambeth until she passed away in 1891. Her husband survived her by a mere two years, his death being registered in 1893. I have yet to find the mother of Henry’s daughters, Arabella Atchley, on the 1871 census. By 1881 however she was lodging in the household of Alfred T Buckingham and his family, at 19 Nursery Row, Newington. Now aged 53, she was still earning her living as a dressmaker. And it seems she had finally accepted that her relationship with Henry was over, as she described herself as a widow. She did so again two decades later when enumerated (as Bella Atchley) for the 1901 census at 26 Pitman Street, Camberwell. By that time Arabella was living with relatives, the Deacon family (she was recorded as an aunt), and was supported by Parish Relief. She had also lost her sight – the Infirmities column of the census schedule showed that she was blind. It is the last census on which I have found her. The last census on which Henry’s mother Sarah appeared was that of 1861. Living at 59 Brandon Street, and still referring to herself as the widowed Sarah Atcherley, she was 59 and supporting herself by working as a needlewoman. Her death, towards the end of that year, was registered at Newington under her real name, Sarah Perkins. Her son Henry Atcherley was not recorded on that year’s census however – or so I thought. It turns out that, like his mother, he was not averse to changing his surname. Furthermore, it appears that he also took a leaf out of his father’s book – by abandoning his first spouse and children, and starting a second family with another woman. Picture credits. 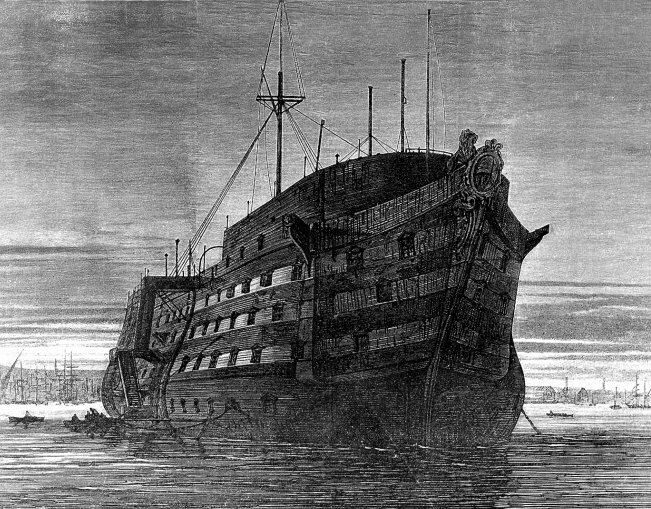 The Dreadnought, hospital ship for seamen, at Greenwich: Image © Copyright Wellcome Library, London (image 30311i), adapted and used under a Creative Commons licence. Extract from GRO birth certificate for Arabella Atcherley: Image © Crown Copyright, posted in compliance with General Register Office copyright guidance. Walworth St Peter: Image © Copyright Charles Thompson, taken from Geograph, adapted, used and made available for re-use under a Creative Commons licence. Index to Porters Admission and Discharge Register, Feb 1887 – Nov 1902, Christ Church Workhouse, Southwark (London Metropolitan Archives item ref SOBG/100/53). Copy viewed at Ancestry – London, England, Workhouse Admission and Discharge Records, 1659-1930. Newington St Mary, Surrey, baptism register covering 1832. Entries for George and William Henry Atcherley. Copies viewed at Ancestry – London, England, Births and Baptisms, 1813-1906. Indexed at FamilySearch, Batch C05563-2, Film 307700, 307701, 307702, 307703 (George, Henry). The National Archives, Kew, item ref PROB 11/1858/315: Will of James Atcherley, retired Captain of the Royal Marines of Walworth, Surrey. Proved 3 Mar 1836. “…I give and bequeath to my dear and constant friend and companion Sarah Perkins …”. Copy viewed at Ancestry – England & Wales, Prerogative Court of Canterbury Wills, 1384-1858. Indexed at TNA Discovery catalogue. War Office (1834), The Army List, for December, 1834. Page 82. Copy viewed at Hathi Trust Digital Library. The National Archives, Kew, item ref ADM 45/4/919 shows: James Atcherley, Captain Royal Marines (retired), who died: 30 October 1834. Notes on executor’s application for money owed by the Royal Navy. Indexed at TNA Discovery catalogue. 1841 census of England and Wales. Piece 1064, book 5, folio 43, page 34. 1841 census of England and Wales. Piece 489, book 19, folio 30, page 2. Dreadnought Seamen’s Hospital. At: AIM25 (website, accessed 13 Apr 2015). The Dreadnought Seamen’s hospital. At: Port Cities London (Royal Museums Greenwich website, accessed 13 Apr 2015). Death of John Atcherly registered at Greenwich, December quarter 1841; volume 5, page 154. Date and place of death of John Atcherley from Barbara Lang. Information presumed to have been taken from death certificate. Walworth St Peter, Surrey, burial register covering 1841. Entry no. 896, John Atcherly. Copy viewed at Ancestry – London, England, Deaths and Burials, 1813-1980. Newington St Mary, Surrey, baptism register covering 1818. Entries 1013 to 1015, Eleanora, James and John Atcherley. Copy viewed at Ancestry – London, England, Births and Baptisms, 1813-1906. Indexed at FamilySearch, Batch C05563-1, Film 307696, 307697, 307698, 307699 (Eleanora, James, John). The National Archives, Kew, item ref Series BT 113, piece 240, page 106 (Register of Merchant Seamen). 1851 census of England and Wales. Piece 1568, folio 390, page 17. 1851 census of England and Wales. Piece 1567, folio 340, page 53. Birth of Arabella Atcherley registered at Newington, June quarter 1845; volume IV (4), page 370. Walworth St Peter, Surrey, baptism register covering 1829. Entry for Arabella Dackombe. Copy viewed at Ancestry – London, England, Births and Baptisms, 1813-1906. Indexed at FamilySearch, Batch C05586-1, Film 307704, 307705. Walworth St Peter, Surrey, baptism register covering 1845. Entry 1325, Arabella Maria Atcherley. Copy viewed at Ancestry – London, England, Births and Baptisms, 1813-1906. Walworth St Peter, Surrey, baptism register covering 1850. Entry 612, Ellen Sarah Atcherley. Copy viewed at Ancestry – London, England, Births and Baptisms, 1813-1906. Birth of Ellen Atcherley registered at Newington, December quarter 1847; volume 4, page 353. Birth of Mary Ann Atcherley registered at Newington, December quarter 1846; volume 4, page 403. Death of Mary Ann Atcherley registered at Newington, December quarter 1846; volume 4, page 291. Walworth St Peter, Surrey, burial register covering 1846. Entry no. 339, Mary Ann Atcherley. Copy viewed at Ancestry – London, England, Deaths and Burials, 1813-1980. 1861 census of England and Wales. Piece 344, folio 108, page 22. Southwark Christ Church, Surrey, banns register covering 1870. Entry for John George Hilder and Arabella Maria Hatchley. Copy viewed at Ancestry – London, England, Marriages and Banns, 1754-1921. 1871 census of England and Wales. Piece 613, folio 71, page 62. 10 Salisbury Row, Walworth, Newington, Surrey. Head: John G Hilder, married, 34, hop [packer? ], born Burwash, Sussex. Wife: Arabella M Hilder, married, 26, born Newington, Surrey. Southwark Christ Church, Surrey, banns register covering 1873. Entry for John George Hilder and Arabella Maria Atchley. Copy viewed at Ancestry – London, England, Marriages and Banns, 1754-1921. Camberwell Emmanuel, Surrey, marriage register covering 1875. Entry for John George Hilder and Arabella Maria Atchley. Copy viewed at Ancestry – London, England, Marriages and Banns, 1754-1921. Marriage registered at Camberwell, December quarter 1875; volume 1d, page 1137. Death of John George Hilder registered at St Saviour Southwark, March quarter 1878; volume 1d, page 77; age given as 41. Newington Trinity, Surrey, marriage register covering 1869. Entry for Aquilla Dackombe and Ellen Sarah Atchley. Copy viewed at Ancestry – London, England, Marriages and Banns, 1754-1921. Marriage registered at Newington, March quarter 1869; volume 1d, page 241. 1871 census of England and Wales. Piece 619, folio 128, page 45. 2 Flint Street, Walworth, Newington, Surrey. Head: Aquila Dackombe, 23, undertaker, born Newington. Wife: Ellen Dackombe, 24, born Newington. Son: Aquila Dackombe, 1, born Newington. 1881 census of England and Wales. Piece 549, folio 12, page 17. 3 Flint Street, Walworth, Newington, Surrey. Head: Aquila Dackombe, 33, undertaker, born Newington. Wife: Ellen S Dackombe, 33, born Walworth. Son: Aquila Dackombe, 11, born Newington. Dau: Ellen Dackombe, 9, born Newington. Dau: Caroline M Dackombe, 8, born Newington. Dau: Fanny M Dackombe, 4, born Newington. Son: John T Dackombe, 2, born Newington. Dau: Emily A Dackombe, 10 months, born Newington. Death of Ellen Sarah Dackombe registered at St Saviour Southwark, December quarter 1881; volume 1d, page 82; age given as 34. Dackombe/Kefford Chart 0400. At: Dackombe Family History and Genealogy (website, accessed 13 Apr 2015). Walworth St Peter, Surrey, marriage register covering 1852. Entry for Thomas Gussin and Mary Ann Atchley. Copy viewed at Ancestry – London, England, Marriages and Banns, 1754-1921. Marriage registered at St Saviour Southwark, September quarter 1873; volume 1d, page 209. 1881 census of England and Wales. Piece 617, folio 95, page 60. 1 Alders Cottages, Lambeth, Surrey. Head: Thomas Gussin, 29, [? brewer], born Brixton. Wife: Mary A Gussin, 29, born Lambeth. Plus 3 lodgers (Jabeth Chorley, a general labourer; and 2 Metropolitan Police Constables). 1891 census of England and Wales. Piece 414, folio 44, page 20. 1 Alders Cottages, Lambeth, London. Head: Thomas Gussin, 39, bricklayer’s labourer, born Stockwell. Wife: Mary Gussin, 39, born Walworth. Plus a lodger (Jabeth Chorley, a carman). Death of Mary Ann A Gussin registered at Lambeth, December quarter 1891; volume 1d, page 331; age given as 39. Death of Thomas Gugsin registered at Lambeth, September quarter 1893; volume 1d, page 323; age given as 41. Note: Surname printed as Gugsin, almost certainly transcribed incorrectly from the original register entry. 1881 census of England and Wales. Piece 550, folio 38, page 24. 19 Nursery Row, Newington, Surrey. 1901 census of England and Wales. Piece 515, folio 43, page 26. 1861 census of England and Wales. Piece 337, folio 165, page 9. Death of Sarah Perkins registered at Newington, December quarter 1861; volume 1d, page 180.